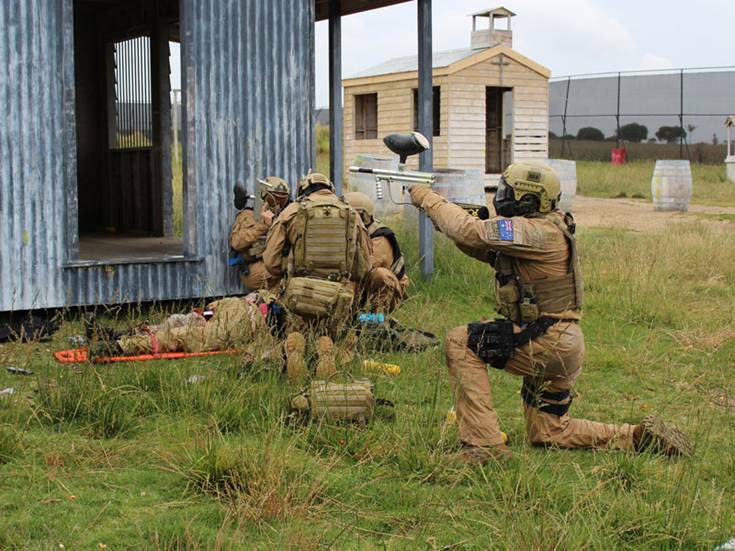 The military style experience and movie-quality game zone prop combination that Delta Force Paintball offers has proven to be a useful resource for Australian military and security personnel. Such elements as full scale Black Hawk helicopters, real aircraft, village buildings, POW camps, buses and other excellently prepared scenarios come together to provide a training ground very well suited to safety and security training for our armed forces and related services. Recently, as these images show from a day at our Paintball Melbourne location, security personnel conducted an intensive rescue and recovery day to gain competency in several required first aid certifications and a chance to practice and hone their skills in various scenarios to help ensure, in a combat situation, they leave no man behind. 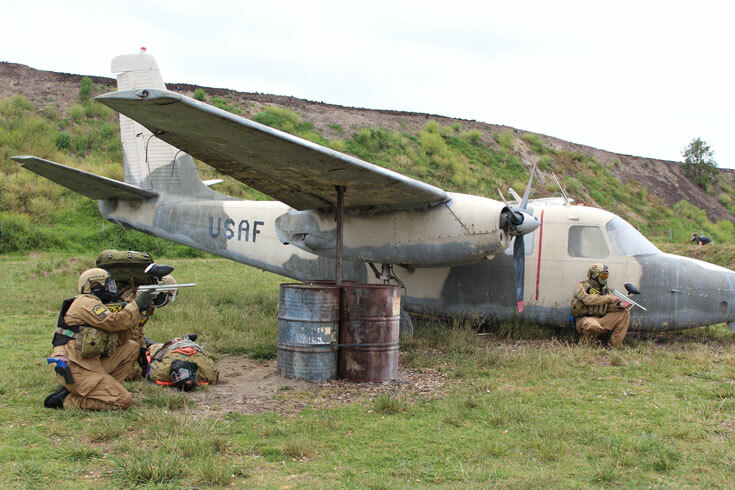 Using a combination of their own and equipment supplied by the paintball centre, the rescue team were put through drills using the paintball centre buildings and props to replicate obstructions and cover similar to that which they might encounter in real world situations. In this way, the various teams are able to hone and polish skills needed to save the lives of those in their care. 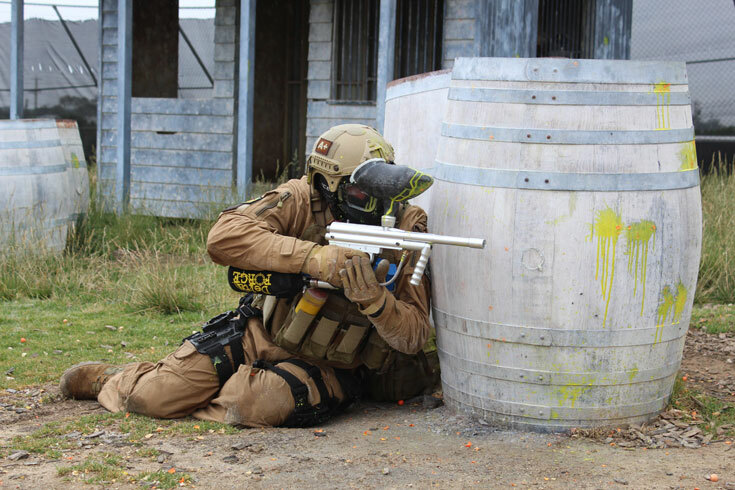 The huge variety of locations Delta Force Paintball offers near most Australian state capitals for these purposes provides an impressive portfolio that includes dry sandy areas, dry sclerophyll eucalypt regions through to dense bush property. This variety, matched with the props and structures ranging from real double decker buses, military aircraft and various building types equates to not only a thrilling way to train or have fun, but a memorable and productive day as well. We would love to keep improving so that we can make your paintball experience even better, so if you have any suggestions please contact us and we’ll do everything we can to satisfy your paintballing needs. To book your next Delta Force Paintball adventure, contact us today.